If you follow on SnapChat (username: merrittbeck) you probably saw me sweating my booty off while shooting this look. It was 102 degrees out, it was humid from all the recent rain, and there was not a single breeze to cool me off! Texas summers are always brutal, but that day felt like a new record. Full disclosure: if you tend to sweat, this dress is not going to hide it! This is another inexpensive find from SheIn – it’s the perfect little party dress in the most vivid red shade. As I mentioned in this post and this one too, the fabric is very thin. It’s sort of a double-edged sword: on one side it’s nice to not be wearing a heavy layer in these hot summer months, but on the other hand, it hides NOTHING. Even one drop of sweat will show through. I’m not trying to dissuade you from buying it, just want you to have all the facts! I don’t wear red very often because it makes such a loud statement, but it’s one of my favorite colors to wear. This shade of red looks amazing against blonde hair, don’t you think? Another red piece I bought from SheIn is this off-the-shoulder number. It looks identical to all the MLM dresses, but at a fraction of the cost (and in my favorite shade of red)! The SheIn style is actually a little longer, which is great – the MLM dresses are too short on me! PS – if you’re looking for the perfect shade of orange-red lipstick, try Revlon in Hot Coral. It’s such a steal and the most stunning color! I actually just ordered a piece from SheIn. I’m looking forward to its arrival, but definitely tempering my expectations! This dress looks gorgeous. Red is a great shade on you! I always had shein stuff to my cart but then never buy them. That dress looks stunning on you and red is your color. In these photos, you can’t even tell you were sweating! That’s unfortunate the dress shows everything but you do look beautiful in red! SO chic lady! 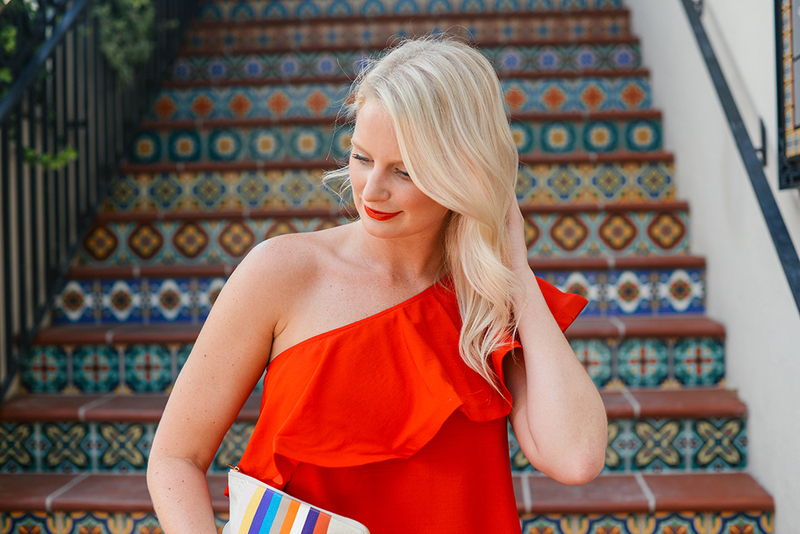 That multicolor stripe clutch is the perfect addition! Happy Friday! This dress is so fun and I’m loving the red! These stairs are also TDF! You look amazing in red, Merritt!!! You do look amazing in red! You look completely put together… can’t tell that your melting at all:) I can not believe this Shein situation. I never buy stuff from those retailers bc I’m always afraid of quality issues. If you recommend it, I totally would give it a try bc you always choose such quality, luxurious pieces.